Our highly automated machine based operation enables us to handle all manner of letter mailings, larger flat mailings, match mailings, member card mailings, self-mailers, postcards et cetera. 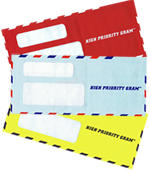 We trim, fold, burst, collate, label, tab, insert, meter, stamp, seal, sort, tray and mail - all directly from our facility. And our Production Team will ensure that your mail pieces are fully compliant with post office regulations before dropping domestically or internationally.